I agree about the harshness of the angles. The campaign has made it clear they are attempting to show Mrs. Clinton in a softer, more approachable light. I also think the whole red arrow pointing right statement I’ve seen is kind of funny. If I could provide any constructive criticism, I’d say it’s a bit too cold. I would also like to push the idea of civility when providing feedback, criticism. We will all be much better off in this industry if we try to put ourselves in other designers’ shoes. If you’re not executing the brief, then take a step back and be nice. Think, try, learn, rinse, repeat. There was always likely to be a vocal outcry however this was designed, at the very least from those on the other side of the political sphere. The colours do grate, it does feel a bit shipping company and it is perhaps too simple for some, but its recognisable and memorable. But all this lurch to the right it points forwards and nonsense is just that, utter gibberish. The 2 tone transparent version on the website footer looks classier. It is different, that is something. 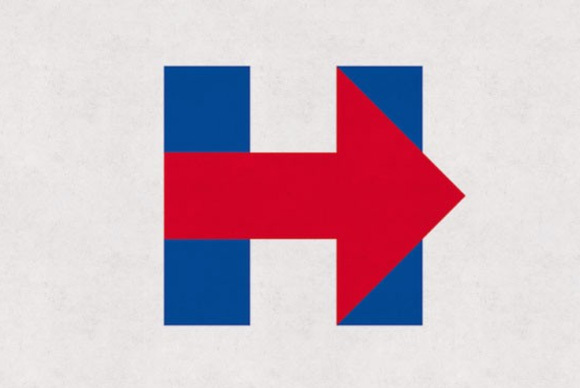 Presidential campaign logos since, forever, have been red stripes representing waves of grain and blue sky, with or without stars. So the fact that it is almost aggressively simple is actually pretty smart. People are talking, talking, talking and nobody is discussing Hillary’s email server. Personally, it brings to mind the early 1980s. A lot of design in that period included circles, square and triangles in primary colors. I mean a lot of design. So for me it has some dated connotations of the warm, nostalgic kind. It could have been better but I don’t hate it.